Dragon Quest XI: Echoes of an Elusive Age launches for PlayStation 4 and PC via Steam this September, and those who reserve the PS4 version ahead of its release will get a few extra goodies with the game. Square Enix has revealed pre-order bonuses for Dragon Quest XI, which will vary depending on where you purchase the title. Those who reserve the title from GameStop will receive a set of eight exclusive buttons, featuring the game’s main cast of characters. On top of that, players will also receive a pair of in-game bonuses: the Elevating Vest and a pack of three Seeds of Skill. The Elevating Vest is a piece of equipment that grants the character wearing it extra experience points after a battle. The Seeds of Skill, meanwhile, are consumable items that bestow an extra skill point on the character who eats them. You can take a look at GameStop’s pre-order bonuses below. Dragon Quest XI is also available for pre-order from Amazon, and players who reserve the title there will receive a slighly different pack of in-game bonus items. Along with the aforementioned three Seeds of Skill, Amazon’s pre-order pack contains the Arriviste’s Vest, a “glitzy gold waistcoat” that awards players with extra money after a battle. Dragon Quest XI launches for PS4 and PC on September 4. A 3DS version was released in Japan, but Square Enix confirmed that edition won’t be localized. Dragon Quest XI is also in development for Nintendo Switch, although that version won’t be available until “much later” due to technical reasons. Fortnite Season 4 Starts Tomorrow – Let’s Celebrate With a Livestream at 10 AM PST! Fortnite’s fourth season is kicking off tomorrow, which means the meteor that has long ominously loomed over players will finally make it’s impact not only on the game world, but on the game proper! 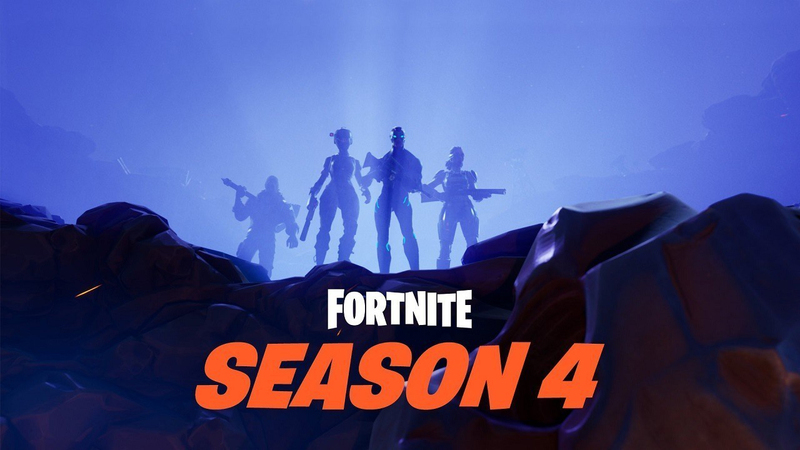 We’re going to be streaming two hours of the game starting at 10:00 AM PST (5:00 PM GMT, 3:00 AM AU) to see what season 4 has in store for players. You should join us! Funko is most well-known fo its Pop Vinyl figures but the company actually has tons of different products, including pins, buttons, and more. Right now Walmart is blowing the lid off its Funko vault and offering some pretty steep discounts. You score free shipping from Walmart.com if you cram at least $35 worth of stuff into your cart, and believe me, it’s surprisingly easy to do between all the Star Wars and other merch on sale now. Some of these items, like the Pop keychains, are less than $2 each. Now that Avengers: Infinity War is in theaters, Marvel Studios is wasting no time in getting fans ready for the next chapter in the Marvel Cinematic Universe. Ant-Man and the Wasp is coming in just over two months, and a new poster has been released–with a trailer on the way. Warning: The rest of this story contains spoilers for Avengers: Infinity War. If you haven’t seen it yet, it’s best to stop reading right now. It’s unclear exactly when in the MCU timeline Ant-Man and the Wasp is set–other than sometime after Ant-Man. That said, perhaps the trailer will shed a little light on whether it is being impacted by what happened in Infinity War. While it was explained that Scott Lang (Paul Rudd) cut a deal with the government to go home after Captain America: Civil War, he’s supposed to be under house arrest. There’s also that pesky thing where half of the universe turned to dust. Still, based on the poster, it looks like those important to Scott remain intact–inducing Hank Pym (Michael Douglas), Hope van Dyne (Evangeline Lilly), and Luis (Michael Pena). Where Hope is concerned, that’s especially important as she becomes the Wasp in this film–taking on the mantle originally held by her mother, Janet (Michelle Pfeiffer). The poster also includes a look at the movie’s villain, Ghost (Hannah John-Kamen), as well as characters portrayed by Laurence Fishburne and Walton Goggins. Hopefully, the new trailer that’s releasing on Tuesday (May 1) will give more insight into their roles in the film. While you won’t have to wait long for the trailer, which will hopefully include some answers, you’ll still have to wait until July 6 to see Ant-Man and the Wasp in theaters. American Gods Season 2 is coming in 2019 and a new video gives fans a first look at the House on the Rock. Production on the eight-episode second season has started and the new season will finally feature the aforementioned quintessential location in Neil Gaiman’s novel. The House on the Rock serves as a meeting place for a conference between the gods. In Season 1, Mr. Wednesday (Ian McShane) and Shadow Moon (Ricky Whittle) were searching for the remaining Old Gods across America. It seems Season 2 will see Wednesday gather the Old Gods to discuss their plan to stop the New Gods. The meeting at the Carousel Room (pictured below) is regarded as one of the more standout moments from the book. Marvel’s Avengers: Infinity War may be the biggest visual spectacle of the year, so it’s no surprise that it cost Disney quite a few pennies to bring this epic vision to life. Infinity War: What Is Doctor Strange’s Master Plan? If you’ve seen Infinity War and are currently reeling from the catastrophic ending that saw half the life in the universe wiped out – including a formidable chunk of MCU heroes turned to ash and others simply struck dead – then you most certainly have a ton of questions swirling around in your head. You may have even picked a particular hero to blame, though it’s clear that there’s really no single person at fault as most everyone in the movie made very emotional choices – some to save loved ones, others to try and gain a tactical advantage – that in hindsight were big mistakes. Tony chose to go to Titan, Thor didn’t aim for the head, the Wakanda faction tried to remove the Mind Stone instead of letting Vision sacrifice himself, Star-Lord let his emotions sabotage his own plan – it was a parade of very human missteps. It doesn’t seem like the MCU will be slowing down anytime soon, as Marvel Studios already has projects planned for the next several years. In an interview with the AP, Marvel Studios head Kevin Feige revealed he just had meetings about movies that are presumably coming out in 2024 and 2025. Though Feige did not share further details about those films and what they might be, he did tease there are still quite a few surprises in store for the MCU. Update: Tomorrow’s new trailer for Ant-Man and the Wasp will shed light on where the two Marvel heroes were during Avengers: Infinity War.